I was a big fan of the television show Agents of S.H.I.E.L.D. during its first season, sticking it out through the rough early patches and enjoying the improvement later in the year. But to be honest, there was simply too many good choices this fall, and not enough hours in the day. Some shows had to fall by the wayside, and AoS was one of them. However, even if you don't watch the show, the main characters matter greatly to the overall Marvel Cinematic Universe. 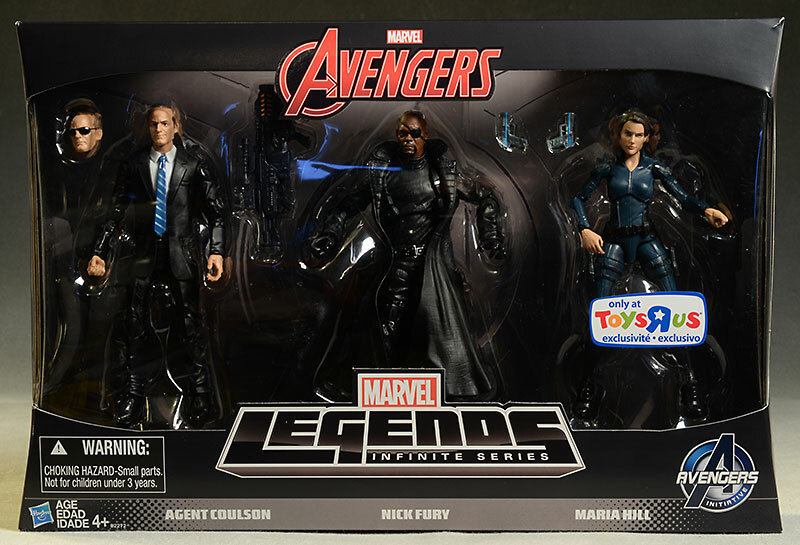 Obviously Nick Fury will remain important to the story line, and both Agent Coulson and Hill are sure to show up again as the story line progresses. Even if you're not a fan of the television show, the new three pack of these characters from Hasbro, done in the Marvel Legends Infinite Series, will peak your interest. This three pack has just started showing up at your local Toys R Us over the last couple weeks. It's an exclusive there, and will run you around $50, plus tax. The box is something of a rarity for a mass market off the shelf action figure release - it's completely collector friendly. That's right, you can open up one end, slip out the inner cardboard tray, and pop the three figures and their accessories right out, no twisties, not tape, no damage. Once you've had your fill of fun, you can pop them back in for storage or sale, no muss, no fuss. That's a huge positive for something like this. The package itself isn't all that attractive, but it does get the information across that it needs to, it shows off the figures nicely, and it's fairly sturdy. There's nothing earth shattering here, but the overall quality is quite similar to every other Marvel Legends release - there's some good, there's some bad. The three likenesses are all reasonable, and you'll recognize the characters on first glance. 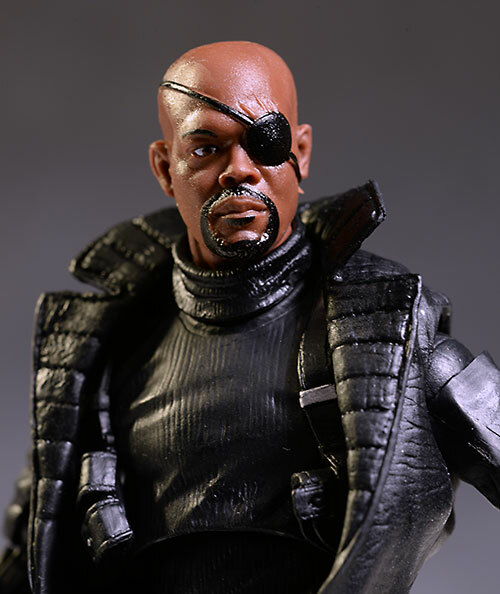 The Fury is perhaps the most off to me, but there's still no doubt it's Sam Jackson. The work on his costume is particularly good, with lots of detail in the jacket and holsters. 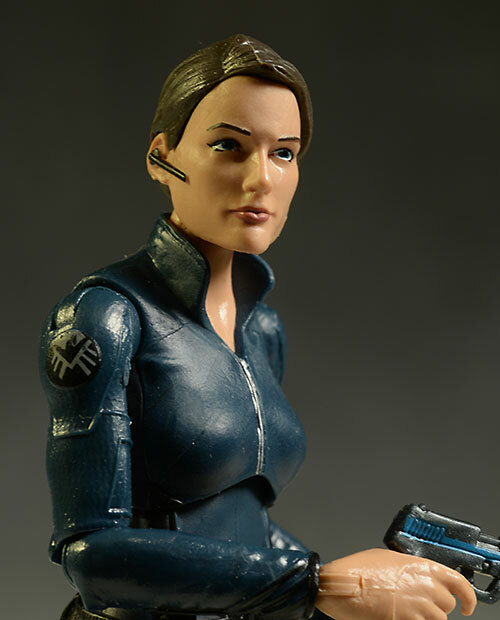 The Maria Hill head sculpt is very pretty, very feminine, and includes the ear piece she so often wears. Her body sculpt suffers from the same anorexia that most ML ladies have, but thankfully her chest is not gargantuan. If I had one real complaint (other than the super skinniness I already mentioned) it's with her giant left paw. This is a very meaty hand, but the sculpt does work well with one of the guns. 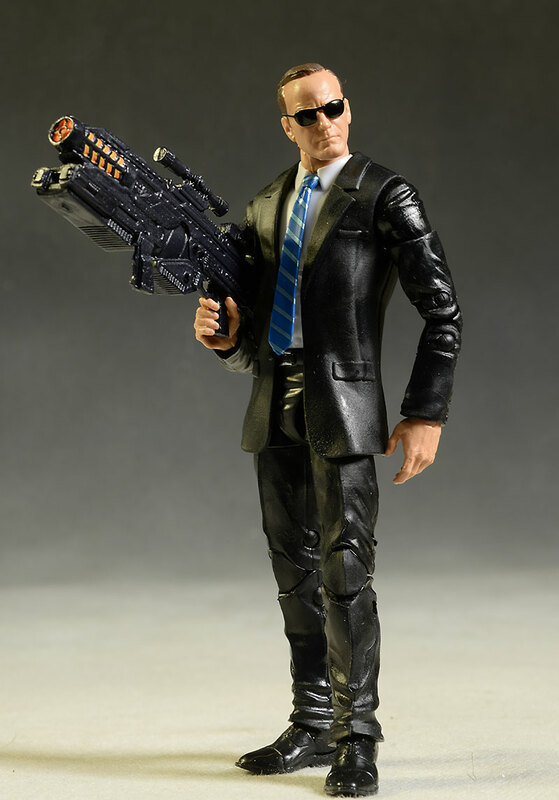 Finally, there's Coulson, who has two head sculpts: one with sunglasses, one without. They swap easily of course, and both have their merits. There's more difference than just the glasses too - without the glasses, he has a more relaxed expression, with softer wrinkles and even a smirk. With the glasses, he's clearly all business. 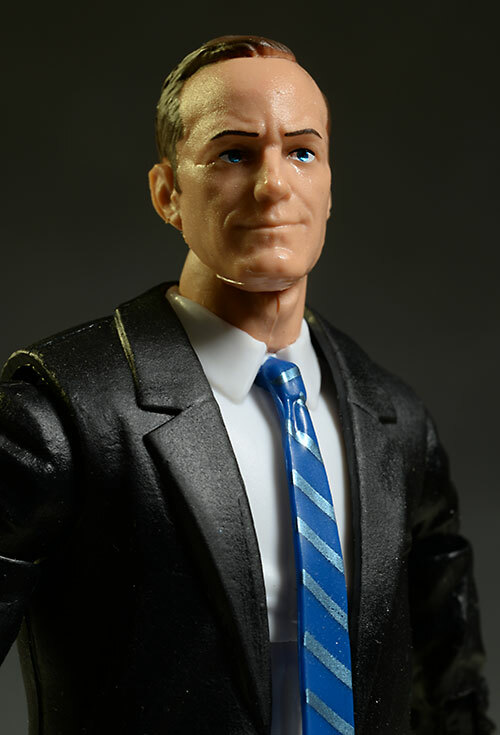 Both heads have some flashing along the chin that's distracting, and neither is the perfect Coulson, but they're close enough for government work. 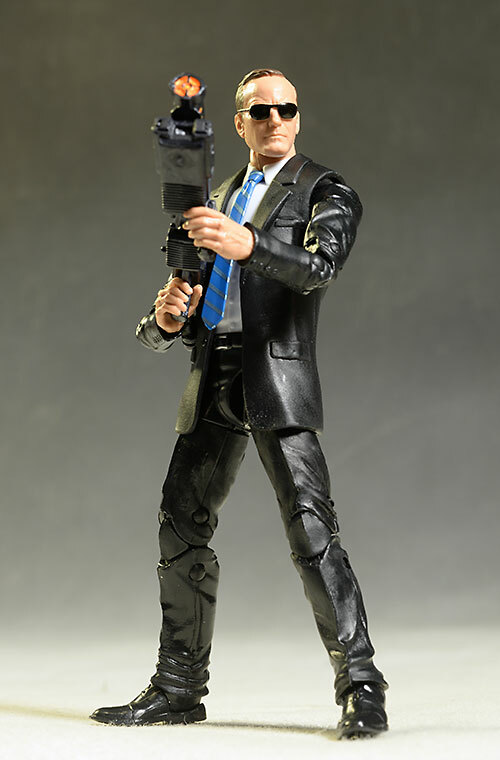 Coulson has a basic black suit and tie for his sculpted body, and I can see this being popular with the customizers. It's always tough to find really good suited figures, and the proportions and detailing here are decent. The paint work on all three is surprisingly clean, with almost no slop across the board. The best work is clearly on the faces, where the eyes, eyebrows, lips and hairline are all clean and have very little bleed, slop or poor edges. 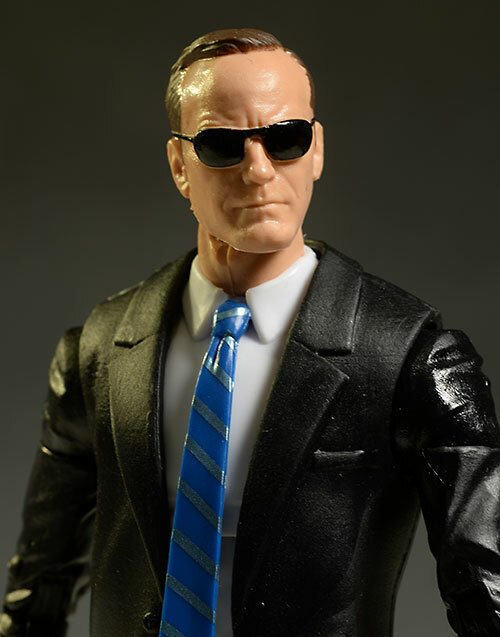 The sunglasses on the alternate Coulson head could be a little sharper, but that's really my only nit. The faces and hands are cast in the skin tone color, which means they are very consistent, but also slightly shiny. The bodies don't have a ton of detail, since these costumes are pretty basic, but what's here is clean. The stripes on Coulson's tie, the highlights on Hill's suit, and the buckles and belts on Fury are all nicely done. My biggest complaint with this set is here, with their articulation. It's not that there's not enough - these are Marvel Legends figures, after all - but what's here simply doesn't work as well as it should. I had trouble getting all three of these to stand on their own, which should never be the case when you have this level of articulation. There's ball joints and pin joints and cut joints everywhere - you want a joint, it's got it. The neck, ab and ankle joints are particularly useful, with lots of movement and usefulness. But in combination, they don't seem to work particularly well. Finding the center of gravity in even standard stances was tricky, let alone anything extreme. You'll definitely want to come up with some sort of stands for these. Coulson had the least amount of trouble, although he's also the one you'll probably want to put in the most upright poses. The high heels and spindly legs on Maria were an issue, and poor Fury had a wonky left shoulder that just wouldn't work right, resulting in a weird angle to his arm in every pose. 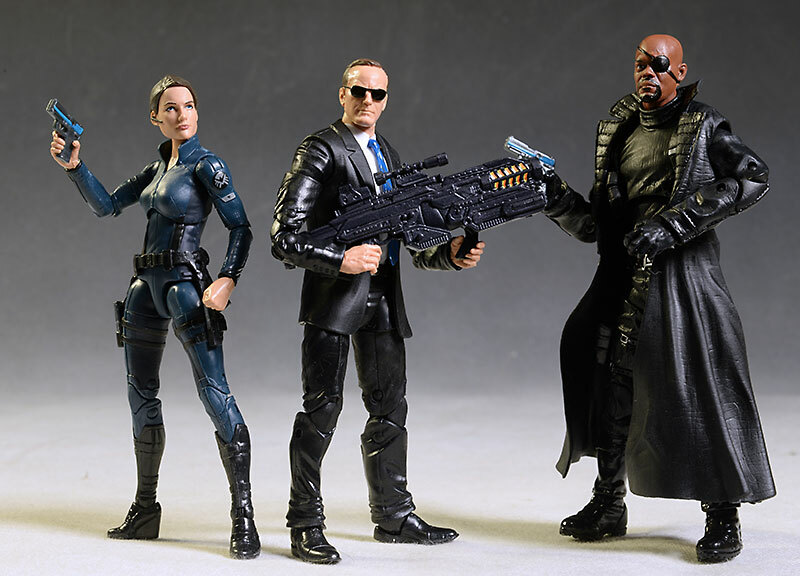 If I were grading these figures independently, rather than as a set of three, I'd give Coulson a solid ***1/2 here, while poor Maria and Nick get just **. 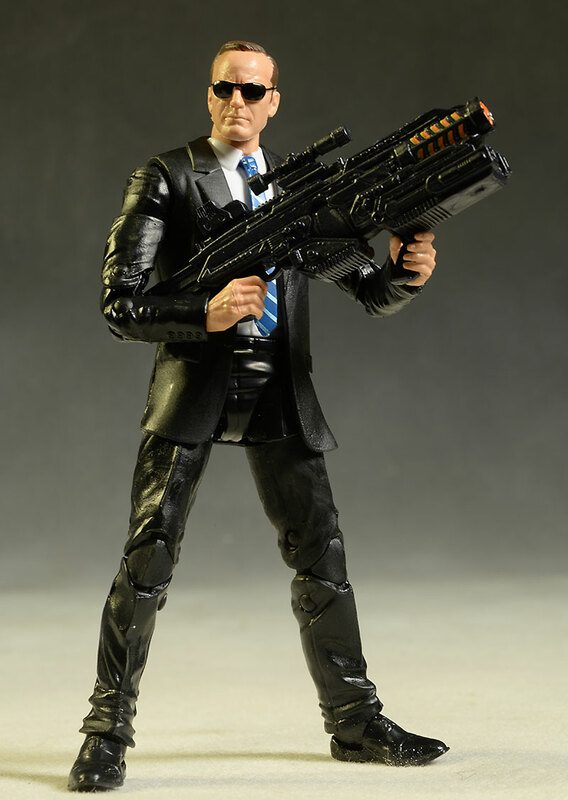 That's because Coulson gets that second, serious portrait, along with the large gun. While others can certainly wield it, I think it goes best with his character based on the films. 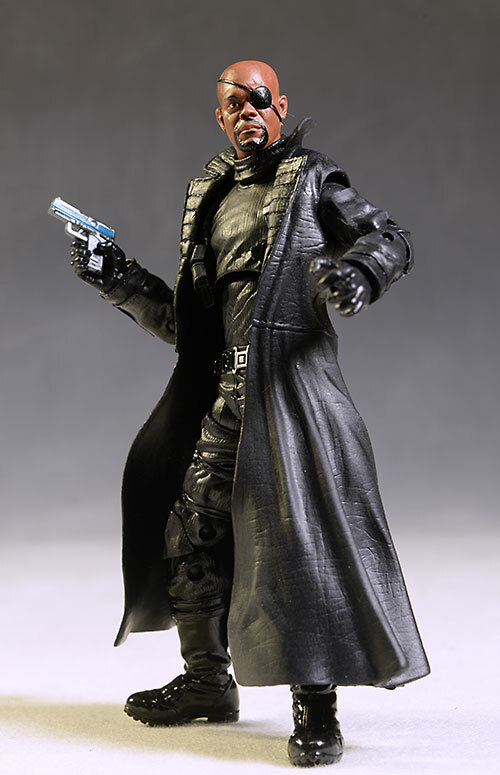 The gun looks great too, and his sculpted hands work perfectly with the grips. The only other accessories are two matching handguns. These pistols are probably intended for Fury, as he has two open holsters to carry them and both of Hill's holsters are already filled with permanent guns. But Maria has a gun gripping left hand, and Nick can only hold one as well, so I split the pair between the two. 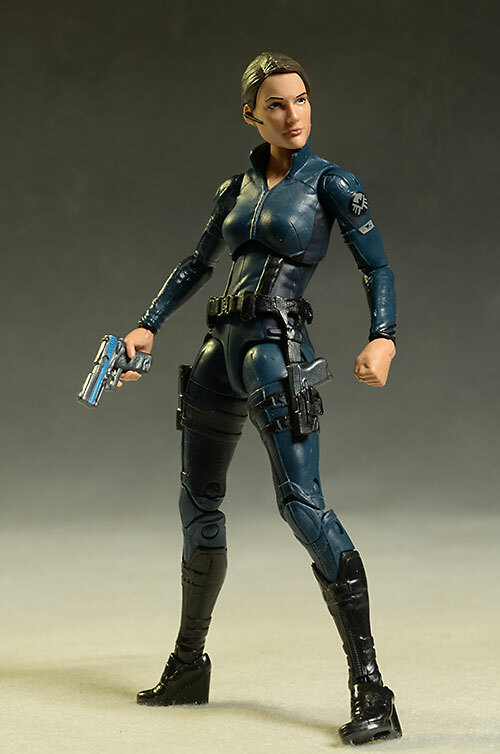 All Marvel Legends figures are fun - lots of posing potential, and interesting Marvel characters make for a good time. My only complaint here is the difficulty I had with the articulation, which sucked some of the enjoyment out of the posing. 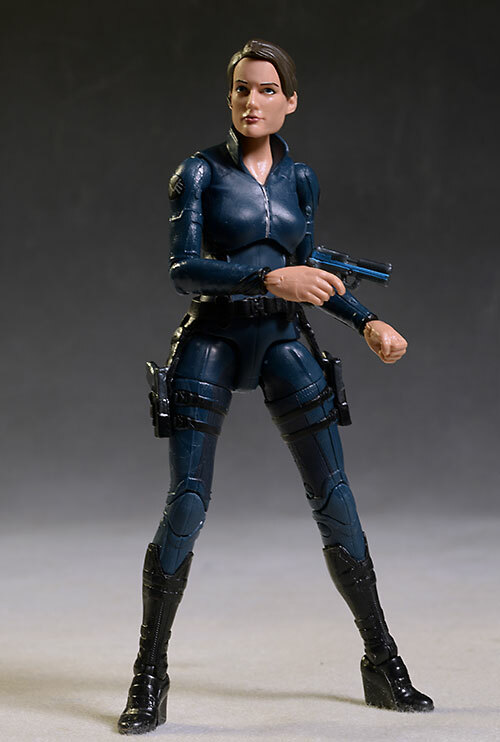 Most regular release Marvel Legends figures will run you $15 - $18 each right now, depending on the retailer of course. Here you get three figures for $50, which is a smidge high, but with an exclusive like this you always pay a slight premium. As always with Marvel Legends figures, take some time adjusting the joints right out of the package. I didn't have any issues here, but there were some tight ones, and you don't want to force or snap anything. There aren't many action figure lines that have the legs that Marvel Legends has. 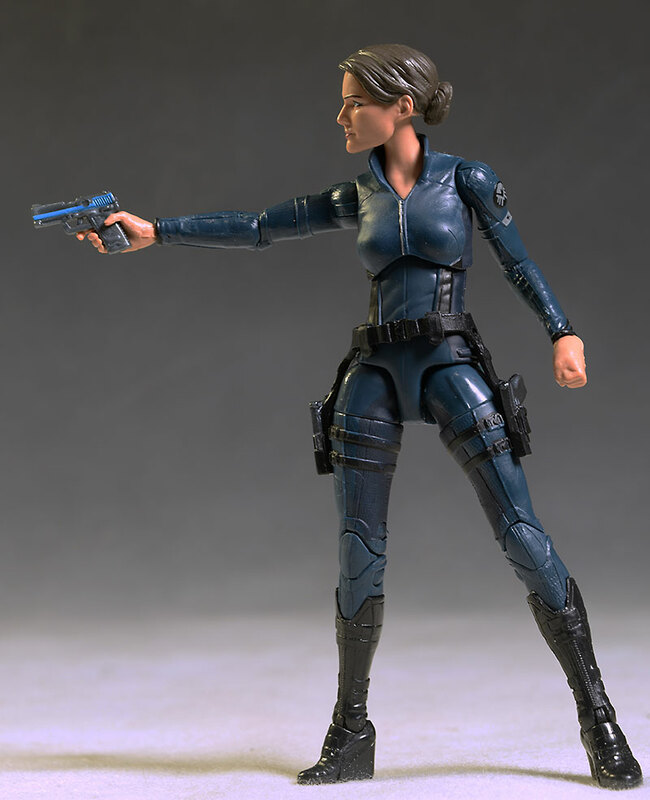 The first review of the series at mwctoys was 13 years ago, and the line has survived a company buy out, many product manager changes, and a shifting action figure landscape, to remain a collector favorite. These three are a nice addition, particularly if you're a fan of the show. They aren't going to set the world - or your display - on fire, but getting these versions allows for some interesting interaction with other MCU releases. The first shipment disappeared quickly at my local Toys R Us, which is always a good sign for the health of the line, if an annoyance to collectors. With another wave of Avengers figures right around the corner. 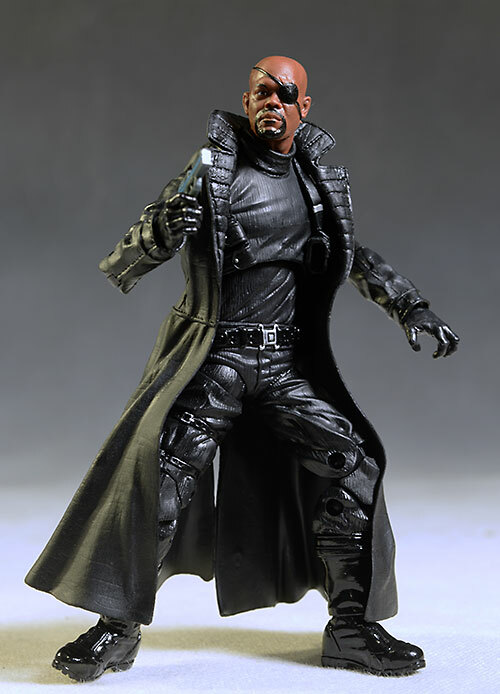 2015 should shape up to be a solid year for Marvel Legends. This set is a Toys R Us exclusive, so your best bet is to head over to the local store or keep an eye on their website for it to pop up. When I checked earlier today they were in stock at the site, but that can vary quickly. Of course, you can search ebay for a deal as well. I've reviewed the first half of the latest Avengers ML wave, with the second half coming soon. The recent Guardians of the Galaxy wave is in two parts - here and here. I also hit up all three BAF's from last year at once. Other previous ML's include part of the Iron Man series, the Arnim Zola series in three parts: here, along with Part 2 and Part 1. Before that, I covered the Terrax BAF wave, in part 1 and part 2; the Red Hulk set, in part 1 and part 2; the last wave of 'icons', the larger scale Legends; the Foom/Hulk wave, broken into one review here and another here; I also covered the early Hasbro ML's, including wave 2 (with a second part here) and wave 1, first at MROTW and then at QSE. - prior to that there was Wal-mart series, series 12, series 9 (including Galactus), series 8 Captain Marvel and Doc Ock, series 7 Vision, series 6 Juggernaut, Wolverine and Deadpool, series 5 Blade, Nick Fury, Sabertooth and Colossus, along with series 5 Red Skull, Silver Surfer and Mr. Fantastic, series 4 Goliath, Punisher, Beast, Gambit, and Elektra, series 3 Daredevil and then the rest of the series, series 2 Thing and Namor, and finally, from years ago, the series 1 review.